Bring out the natural beauty of your GoldfishContains Phaffia Dried Yeast, naturally rich in the carnotenoids necessary to develop natural color and beauty. The addition of Astaxanthin further improves the color enhancing capacity. Helps reduce stress and stress related diseasesThe powerful anti-oxidant Polyphenol acts as an aid to help reduce the overall stress level of your pet which is common in a closed environment. No artificial color or flavors addedThe natural red color will not negatively impact your pet’s health, bowl or aquarium water. A complete and balanced formulation, no supplemental feeding is necessaryContains all the necessary nutrients your pet needs to live a long and healthy life. The Laboratory verified growth characteristics makes this diet a superior choice over the competition! 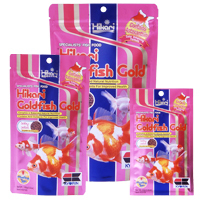 Best for all Goldfish varieties and baby Koi larger than 35mm or 1.5 inchOur floating baby pellet is easy to feed and allows you to readily monitor your pet’s intake to help avoid over-feeding and the related water quality and health issues that can result.